It might be a bit ridiculous to even mention this project, I mean we’ve all cut the legs off a pair of jeans before to make jean shorts. These particular jeans have really special significance to me though, so I wanted to document them as they went into their next phase of life. These were my first pair of Seven Jeans and I bought them at Barney’s. It was the first time I spent that much money on a pair of jeans and they were the beginning of my little denim collection. These jeans looked so great that my friends Angela and Cassandra also bought the exact same pair. 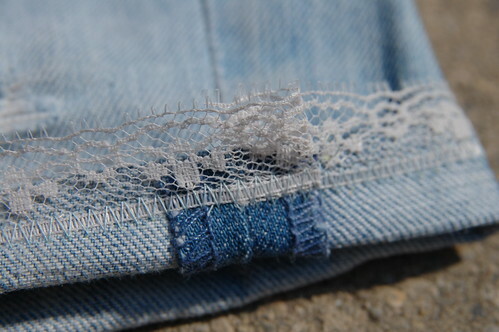 I wore mine to death and have repaired them dozens of times, the denim is pretty thread-bare now. I thought I could get at least one more summer out of them as shorts though. it’s adorable! i love the cute details you add into the things you make! You’re amazing Karyn! You always amaze and inspire me. These are the cutest, most tasteful, little jean shorts I’ve ever seen. Will you make me a pair? 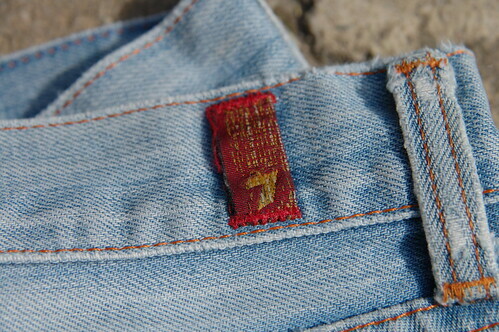 I still have my first pair of jeans I bought for a sky high price! I got them in the Netherlands, and he had to convince me from Italy, to France, to when we found them in the Netherlands, that they were worth it! I will remember this post for when I need to refresh them!